Does anyone have this cabinet or one like it? Thread: Does anyone have this cabinet or one like it? I'm trying to save up for this: www.amazon.com/gp/product/B002NQN3EE/ I like the leaf on the back for when doing larger quilts and that it folds down to save space when piecing. 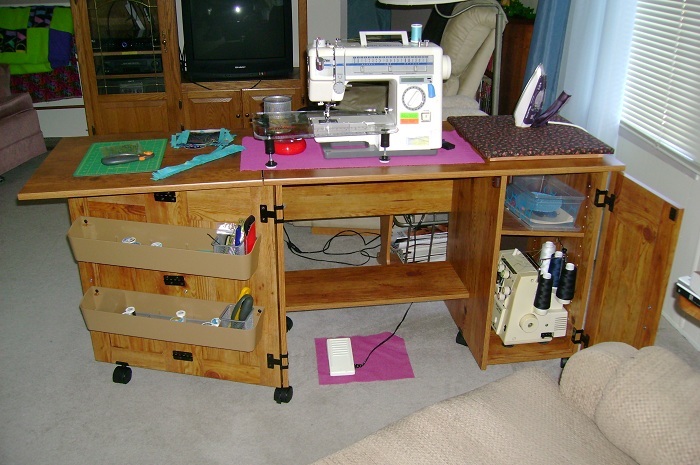 Plus I want one that lets me put my machine inside so the bed is level with the table (I have that now but the brackets block the hole for the knee lift so I can't use it). Anyone have one like this? Or are there any others that are the same, only cheaper? 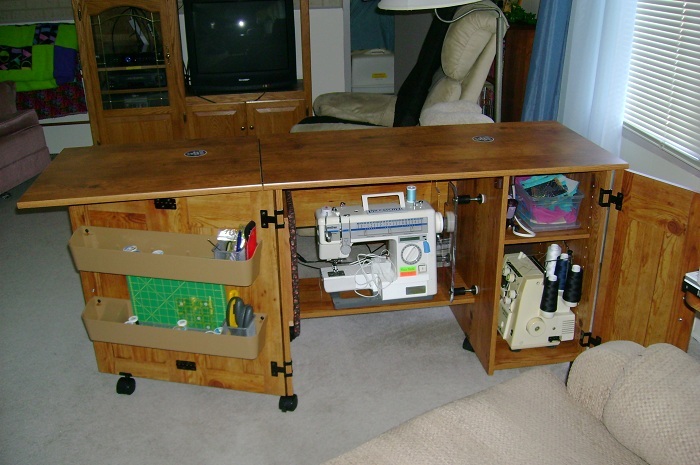 I put a small table behind my sewing table when I need an extension. I have two tables. I have a Gidget table with a drop in it for the sewing machine (my machine is an older, smaller one so I filled in the gaps with a plastic place mat I cut up). I paid around $125 for the smaller Gidget table. The other is a Sauder table, I got it at Walmart and they do go on sale frequently for $99. It doesn't have a drop in although my husband said he could probably rig one up for me. I have this exact cabinet (here it's the Horn 'Eclipse') and I LOVE it. When I bought mine I got a 'blank' insert for the top as well as one cut for my Janome. I use the blank as a light box by putting a couple of battery lights from the Pound shop (Dollar store, lol) on top of machine when in the down position. I've since bought a longer arm Pfaff QE 4 and it almost fills the space, so I haven't bothered with another insert. I love having all my things to hand - I keep a small iron and pad on the right side so I don't have to move if I just want to do small jobs like piecing seams, binding etc. The problem is that I don't have the space to store another table. that's why I like the drop-down leaf. It would not take up any room when it's dropped down. My current table is like the white one you have, and one of those white brackets that hold the shelf is right in front of the hole for the knee lift. My husband had to make the hole in the desk larger to accommodate my 6600 so there's no wiggle room. thanks! that insert idea sounds like a good one. I have a light box but my kids are always using it. I've never had a table with a lift inside so that's also something that I really like about it. At $950 I need to start saving up my $$. if you will let me know exactly what you want I believe I can save you some money. I don't have it, but it looks wonderful! 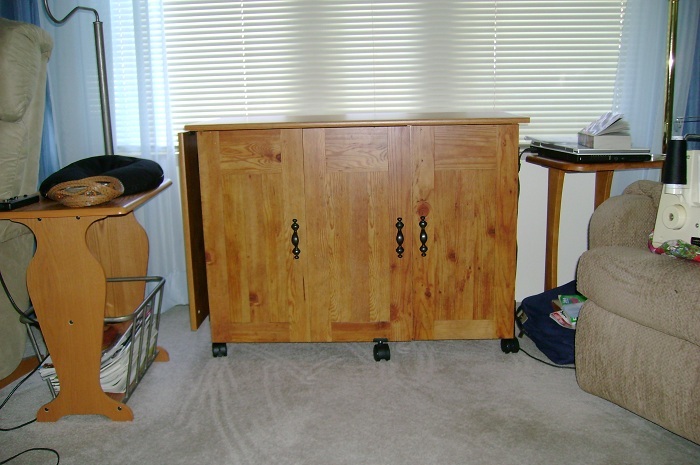 My cabinet also has a leaf that folds up - it stays up as I use the space underneath for quilt kits and drawers of fabric. I like the expanded work space! I have one that looks like the 2nd, 3rd, and 4th pictures that came from Walmart. It's pretty well made and I love it. I keep it unfolded but in the back of my mind I realize I could fold it up small if I needed/wanted to. I prefer the cheaper sewing furniture so my heart doesn't break if it gets dinged. I have a Koala cabinet I purchased years ago. It is very large when opened up. I leave it open all the time, unless I am having a party and need the extra room. On the part that opens up in front of my sewing machine, I have a very large cutting mat, which comes in very handy! I bought that same cabinet last fall from a Habitat Restore for 40.00...I love it. I have the Kangaroo Aussie and absolutely love it! The quality is great, and the fold down quilting leaf is a real space saver. Mine is a bit bigger and I've never had to open it all the way, but love knowing that I can. I purchased mine through Connecting Threads (no local dealer) and it came with $275 of their fabric and notions as well as a gift card and free shipping. I don't know if they are still running that special, but watch for others on their site. I have the Sauder table and love it. 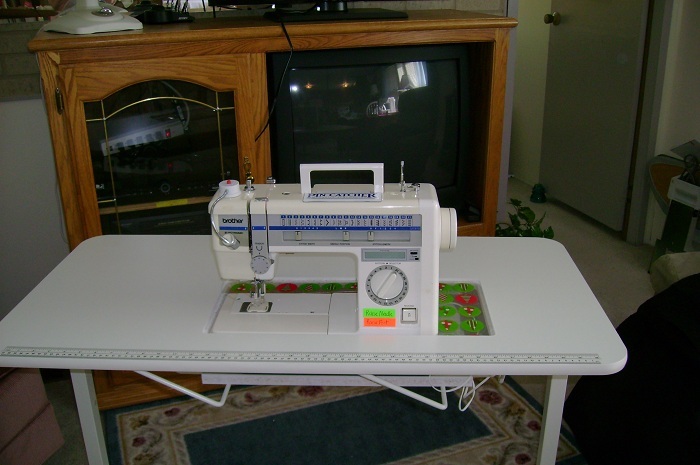 I do not have and will not put in a drop in function because I can move the machine back to have work space in front, then move it back when sewing. I also love all the storage. I would however, put a two by four under the extension to stabilize it. I sent you an email yesterday but didn't hear back. Maybe it went into your junk folder. Check out Tracey's tables they are more reasonable than Horn and Koala and made very sturdy and prices are good. You can also custom order different options. They are from WI. No affiliation but a happy customer. They look nice but I don't understand why companies don't put prices on their website. I hate emailing for prices. Their website has very little information otherwise too. I'll still email them though-thanks! I have the Wallaby. I purchased mine from Joann's online a month or so ago. It was on sale. I feel like that it was a bargain and I am very happy with mine. One door arrived damaged but the company replaced it immediately. They were really great to work with. Also, if you go to their site, they will point you to Youtube videos that show you step by step how to put it together. It was realatively easy for me & my husband to put together. So far the ones I'm looking at fold down in the back. It wouldn't be good for my space if it didn't so I'll be sure to watch for that. We don't have a craigslist here. There is one for a town about an hour away so I can look at it.